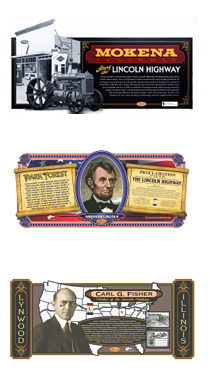 The Illinois Lincoln Highway Murals, created by artist Jay Allen for the Illinois Lincoln Highway Coalition, won first place in the Murals/Exhibit Graphics category in an annual sign contest presented by Signs of the Times magazine. Now the murals are competing in the Signs of the Times 2013 Readers’ Choice Awards. They need YOUR help. It’s EXTREMELY easy and fun to see the competing projects. Every mural is a hand-painted, unique work of art. So far, 29 have been installed. Upon completion, the series will be one of the largest works of public art in the country. Visit https://www.surveymonkey.com/s/8DV5THL and vote for your 3 favorite projects, including of course the murals. Voting is limited to once per computer and concludes on February 8. The Joliet Area Historical Museum, at the crossroads of the Lincoln Highway and Route 66 in Joliet, Illinois, is asking for help in restoring its 1928 Lincoln Highway concrete marker. According to a release, the museum hopes “to raise $5,000 to restore the highway marker which is deteriorating rapidly. Restoration includes: stabilizing the interior rebar, re-adhering the broken segments, removing bronze disease, brightening the paint, and displaying it inside.” Of course, there is no paint — the colors are in the concrete — but the rest sounds like a worthy endeavor. 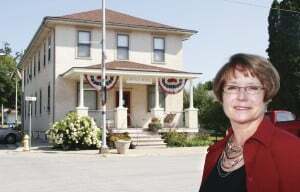 I’m catching up on some old articles, including this nice feature in The Quad-City Times of Davenport, Iowa, that recounts the story of the Lincoln Hotel along the Lincoln Highway in Lowden Iowa. While all things should look similar, the “hidden” address of Lincoln Highway News has changed slightly. 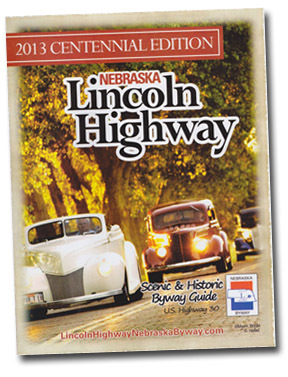 You’ll still find this blog at http://www.lincolnhighwaynews.com but the new “hidden” address is https://lincolnhighwaynews.wordpress.com. The former address, http://brianbutko.wordpress.com, will now serve as the “hidden” address for my website, whose main address is http://www.brianbutko.com. The old version had become impossible to update. Confused? Don’t be. Nothing has changed much except the behind-the-scenes addresses. I made a few minor tweaks, and about the only regret is the site visits counter had to start over. So welcome to the same Lincoln Highway News!